Mayor Frank G. Jackson and Division of Fire Chief Calvillo joined residents at the Shamrock Club Memorial and Firefighters Memorial Rededication Ceremony. The memorial, which depicts two firefighters battling tongues of fire, honors the 77 brave Cleveland firefighters who gave their lives in the line of duty since the founding of the department in 1863. 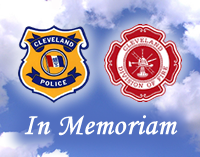 The Firefighter Memorial was reinstalled on Erieside Avenue near the First Energy Stadium on Tuesday, March 12 following a six month-long restoration project. For Neighborhoods: Residents are asked to keep an eye out for groups of people hanging around vacant houses where there have been boards ripped off or doors kicked in. Those conducting "urban mining" may be stealing pipes, and if there is a strong gas smell in the area the Division of Fire should be called at 911. If there is suspicious activity, the Police should be called. Car and Bike Safety: Seat belts and helmets should be worn at all times.